Now, I’m pretty new to World of Warships in general. Most games that involve the ocean are games I avoid because motion sickness is not fun. However, I was curious to see how World of Warships would play on console, so I agreed to give the weekend beta a test spin. I did not have a ton of time to devote to it, so I played some bot matches, as that’s all I saw. If the player matches opened up, I was not aware of it, which is absolutely fine with me. I’m about as green as they get, and I would not have as much fun getting smashed by players with more talent in my first time at sea. So, I took to the seas in my Japanese Chikuma ship. I played a few rounds of “Capture the Base”, on several maps, and I have to say, World of Warships is visually very pretty on the Xbox One. My greatest fear was assuaged, as the waters were not so choppy as to make me nauseous. That being said, the water looked incredibly real, as did the world around me. Perhaps that is due to me spending a lot of time zoomed in, looking for enemy ships to blast. I’m grateful the game doesn’t rock or roll while you’re zoomed in like that. These matches were 7 vs. 7 against NPCs, and though we handily won every match, they were not without casualties. Thankfully, I was not one of them. Each team had a base towards the center of the map, and it was up to us to defend our own base, while also capturing the other team’s point. Of course, simply obliterating their forces also means you win – which is the game plan we wound up going with. After all, 15 minutes is a long time for a match. If we can turn it into a five-minute stomp, why not go that route instead? There wasn’t much of a tutorial, but it wasn’t honestly needed. The game shows you how to turn your ship, how to zoom in and open fire, and the speed of your ship is visibly shown. You use A/B to either go to full reverse, full speed, or stop, and the UI makes it very clear what you’ll be doing. The repair button is clearly labeled as well, so when your ship is on fire from damage, you can repair it (and hopefully it comes through for you in time). The sounds of the cannon fire is very satisfying, and it’s cool to watch the shells that miss create huge splashes in the water. There are so many little aesthetic things that are pleasing about World of Warships. I enjoyed being able to scope in on ships that were even far away and launch a full volley of shots, to watch and see how they landed. The game also let me know when I was detected by the enemy, but I had no fear of them. The only thing that really made this feel slow to me is how long it takes to reload our cannons. I can only imagine that goes down with higher-tier ships, or with upgrades to them. It’s another thing that makes sense, thematically, but I want to get right back to shooting. I don’t mind grinding a ship to gain access to the next ship – I’d rather do that in most cases than spend real money on them. That is, unless I’m really vested, and spend a lot of time playing, but that’s another story. 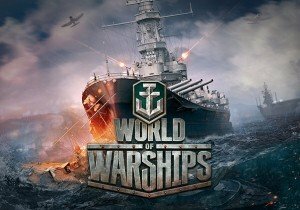 I do have to say my experience with World of Warships: Legends on Xbox One was pretty positive. I enjoyed playing more on a controller than I do on a keyboard and mouse. There’s something tactilely pleasing about zooming in with the triggers and popping the Right Trigger a few times to unleash a volley of doom at an enemy vessel. Couple that with me not feeling ill playing it? Definitely positive all around. I can imagine that the premium ships are much better than the standard ships you spend real money to unlock faster, or simply grind out, but that’s not the focus of this. The actual gameplay felt smooth, controls were sharp and responsive on my Xbox One controller, and it looked gorgeous. We’ll focus on the other, more intricate things somewhere down the line.